Where to eat breakfast in Barcelona? Home » WHERE TO EAT BREAKFAST IN BARCELONA? WE KNOW THE BEST BREAKFAST PLACES! Breakfast is the most important meal of the day (especially if you have a morning tour!). But while many hotels include breakfast with the room, others might not, and then staying at the hotel can be really expensive. Plus breakfast time is a wonderful time to watch the locals get ready for their day. So when the Forrester asked me for some good breakfast ideas near their hotel, I thought that would make a good post for you. So today I would like to share some of the best places to have breakfast in Barcelona (some are also places where I go before starting my own tours!). Enjoy! Pastry-makers since 1929, it was the first local to offer cafeteria and a tea room in the city, and now it’s a classic. Before getting a table, check out their displays and make a mental note of what are you going to order: one of their sweet pasties, one of their savory quiches, one of their mini-sandwiches…? Then seat down and they’ll come to the table to get your order. Even if you don’t want to have breakfast, just take a look inside: it’s a trip to back the past! If you ask a local where to go for tapas, they’ll say come here. But if you ask them for places to go for breakfast, they are not that likely to recommend it. However breakfast here… is absolutely amazing! 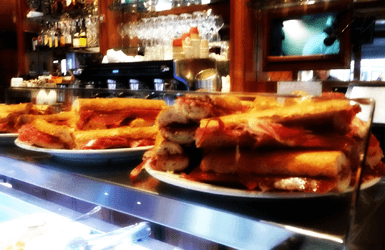 They have lots of sandwiches on display during breakfast time, but their Jamón sandwiches with tomato spread, olive oil and freshly baked bread are a must. And their Spanish Omelette is also delicious. Whatever you order, it’ll be an ideal breakfast. If you are visiting the Boqueria Market the first thing that day, make sure to have breakfast in this busy bar. Many locals go their for a esmorzar de forquilla (“fork breakfast”, that is a heavy breakfast that is almost as complete as lunch): omelet, tripe, cap-i-pota offal stew, oxtail… But if you prefer to start your day in the sweet side, then order one of their famous xuxos: a deep fried bun stuffed with cream. You won’t regret it! Love dairy and chocolate? Granja Viader has been in the dairy business since 1870, and in the early 1900’s they founded the most famous chocolate shake brand in Spain: Cacaolat (still for sale!). Aside from Cacaolat, their specialties are the suís (hot chocolate with whipped cream), “mallorquina” milk (boiled with cinnamon and lemon zest, served cold), cheese cake, and mató riccotta with honey. 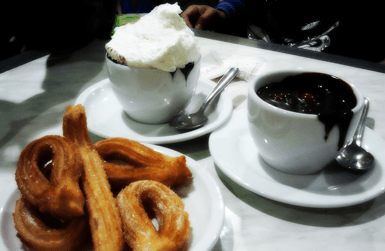 This is also one of our favorite breakfast places for churros and hot chocolate. As its name indicates, it’s located right in front of the Barcelona opera house, El Liceu, and it was the place where people went for a snack before or after the opera show. The owner is the founder and president of honor of the European Historic Cafes Association. Their breakfast go from the typical breakfast in Barcelona (coffee and a pastry), to continental and American breakfast. AND BONUS! These places are very conveniently located in the city center, but is there any place where to eat breakfast off the beaten path? This little cafeteria located in Passeig de Sant Joan used to be a dairy shop, and they have preserved their nice vintage, well decoration. They have really good home-made pastries and cakes made with fresh products. It’s usually full during meal hours but it’s worth the wait. On weekends they serve brunch. So what about you? Head to the comments below and tells us: what are your favorite places to eat breakfast in Barcelona? Hi Marta. I have already booked the Gaudi tour with your organization. I am interested in a recommendation for BREAKFAST in Eixample near Casa Batllo. Too many restaurants are New York or French style pastry shops. I prefer tradicional Catalan places for hombres trabajar–cafe cortado, etc. Can you advise please? The area around Casa Batllo is an office are, kind of a local down town… with Gaudi buildings! So don’t expect to find dirty bars packed with blue collar workers: you’ll have to take the subway and go a few stops away for that. In the other hand, there are also many hotels in the area, so it’s difficult to find bars where there’s only locals: there’s always gonna be some tourist, too. 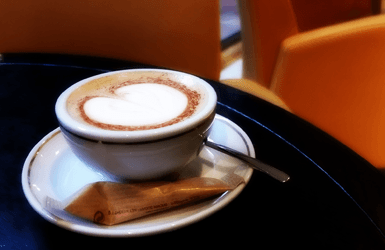 This said, you could try Forn Rambla 31, a bakery in the corner of Rambla Catalunya and Diputació st, frequented by office people in the area having a cortado and a little before work. Or La Moreneta, on Pau Claris with Consell de Cent, frequented by locals taking the suburban buses that depart from that corner.